Scientists have been using tracking devices on large animals for decades to monitor the health of a herd, or study an animal’s range and habits. 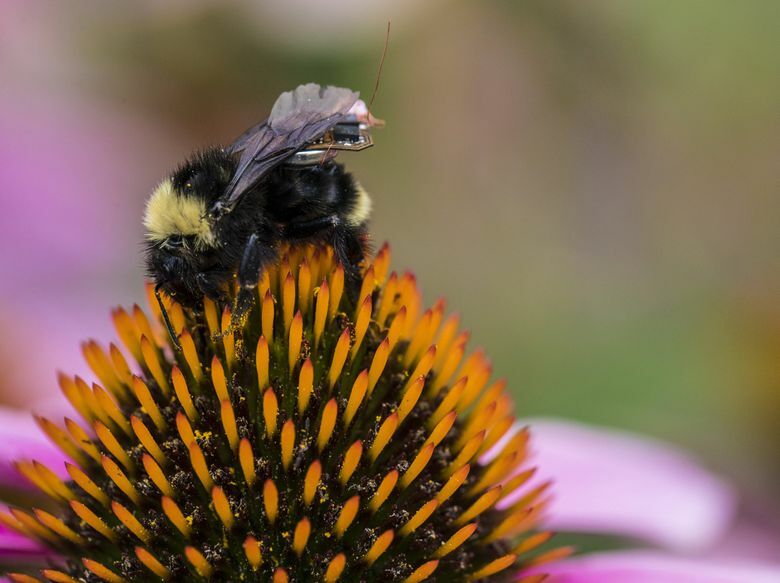 Now, a group of University of Washington researchers has figured out how to put a tiny tracking sensor on a bumblebee. 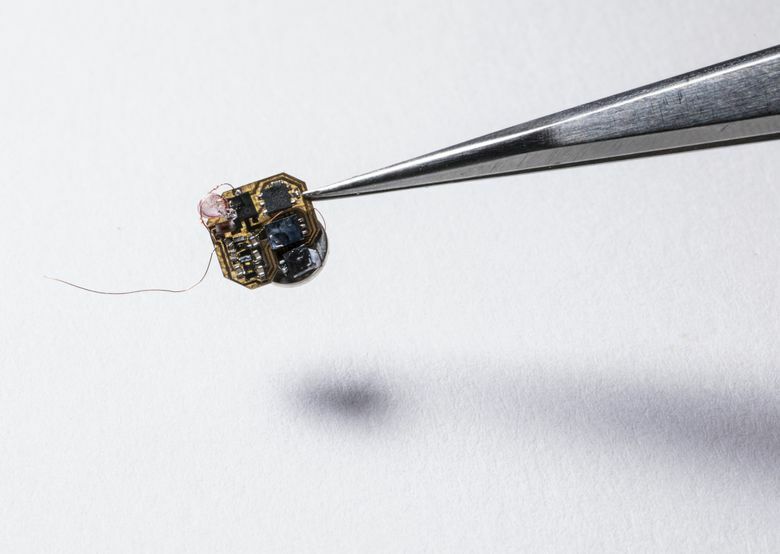 The sensor, or “backpack,” weighs as much as seven grains of dry rice, and can be glued to the back of the insect. One day, a fleet of bees equipped with these sensors could help farmers monitor the health of their crops, and give biologists insights into how bees forage for food, find pollen and navigate through the environment. To put a backpack on a bee, researchers had to solve two riddles: How to make a sensor lightweight enough to be bee-friendly, and how to use it to track the insect’s location. The work grew out of an earlier engineering challenge the UW team tackled: an effort to create a wireless, robotic flying insect. RoboFly could flap its wings and fly on its own, but the device couldn’t fly far, said Shyam Gollakota, an associate professor in the UW’s Paul G. Allen School of Computer Science & Engineering. RoboFly “consumes a lot of power, and that has been the biggest fundamental challenge of making it work,” Gollakota said. That led the team to another inspiration: “Why don’t we use nature’s basic flying machine?” he said. To researchers, a living organism like an insect is a brilliant solution to the problem of energy storage because it recharges its living “batteries” by foraging all day long. Putting aside RoboFly, the group began working on a way to put a sensor on an insect. And the bumblebee was the perfect candidate for the job. It’s robust enough to carry a tiny, battery powered payload. It returns to the hive every night, where the sensor’s battery can be recharged wirelessly. 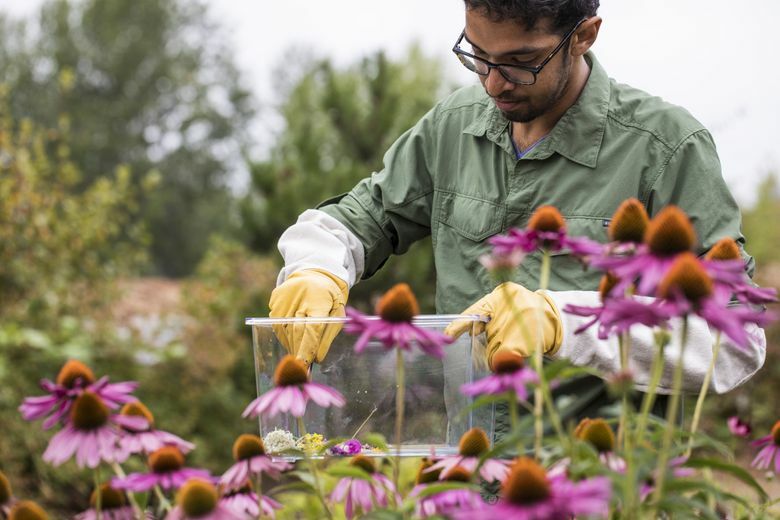 Bumblebees are used in agriculture, and they’re relatively gentle, said Vikram Iyer, a doctoral student in the UW Department of Electrical & Computer Engineering. Iyer became the team’s bee-wrangler, and was never stung, he said. This isn’t the first time that scientists have used sensors, or bee “backpacks,” to follow a bee’s movement. 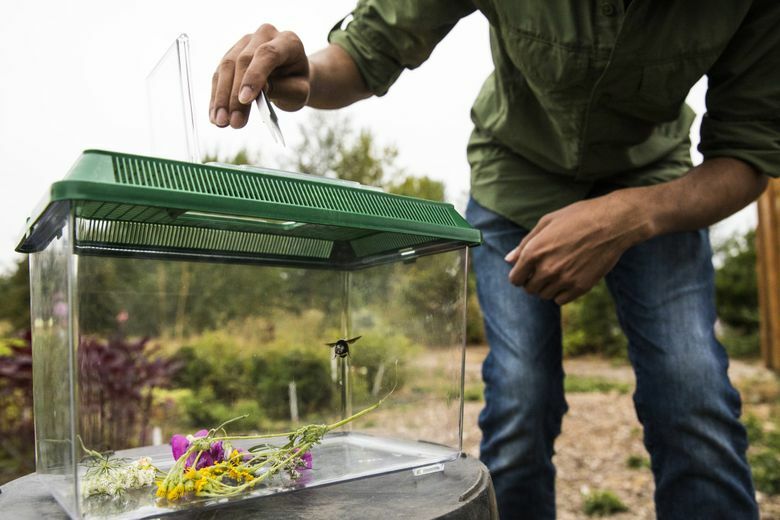 But those earlier efforts could only track a bee over a short distance, UW researchers said. Because GPS receivers use too much energy, the team had to find a different way to track bee movement. They set up multiple antennas that broadcast signals from a base station across a specific area. The receiver in the bee sensor uses the strength of the signal, and the angle difference between the bee and the base station, to triangulate the insect’s position. The information is stored in the sensor, and downloaded when the bee returns to the hive at night. The researchers are still perfecting the technology, but they hope to interest farmers in the technology next year. Many farmers use drones to monitor their crops, but drones run out of juice after 10 to 20 minutes and have to be recharged. Bees, on the other hand, fly all day long. Iyer and Gollakota estimate that the sensors themselves will cost only a few dollars to manufacture, and the rest of the equipment, including a base station at the hive and antennas in the field, is also inexpensive. The sensors can collect information about temperature, humidity and light intensity, painting the picture of a whole farm. The researchers acknowledge that sensor-equipped insects sound like something out of a futuristic spy movie, and could raise privacy concerns. That’s one of the reasons why they’re publicizing their work. It’s also a reason to use bees, since people are naturally wary of them because of their ability to sting. To conduct the experiments, the research team bought some mail-order bumblebees and let them go in a greenhouse. Iyer also caught some native bumblebees at the UW Farm, and discovered that Washington bees are more robust than their mail-order cousins. Gollakota said part of the research was to make sure the bees weren’t stressed by the weight, and that they were well-fed and happy. 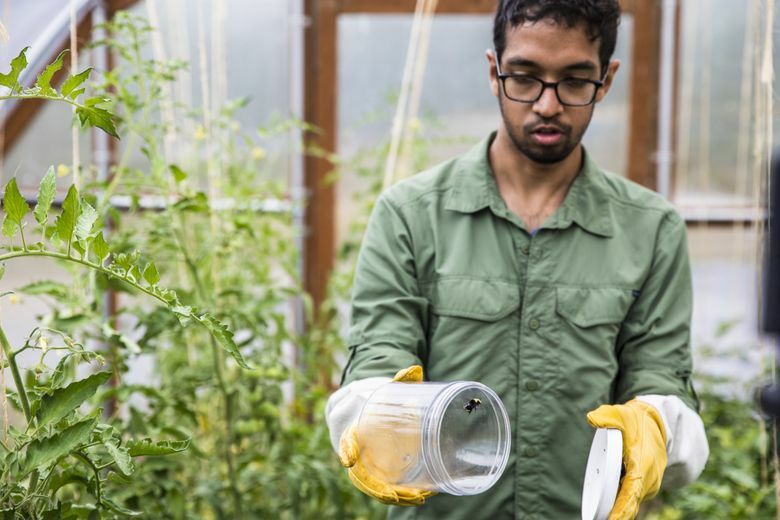 When the experiment was over, Iyer said, researchers took the sensors off the native bees and let them fly free.